Most of the low cost LED Emergency lamps do not have LED indicators to show charging and load on conditions. 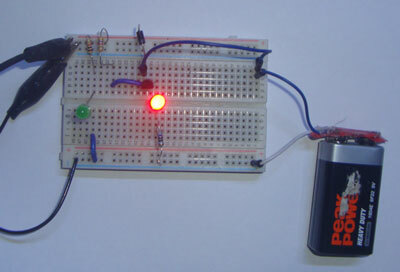 This simple circuit solves the problem. It can be hooked in the Emergency lamp. A Green LED lights when the charging is going on and turns off when the charger is disconnected or power fails. It gives a good indication that current is flowing to the battery. A Red LED lights when the load turns on. It also indicates that charging process stopped. 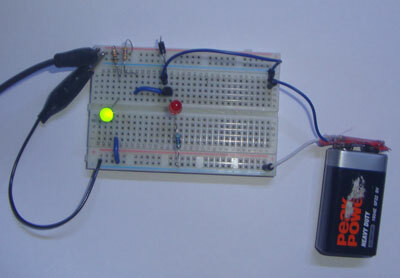 Working of the circuit is simple. 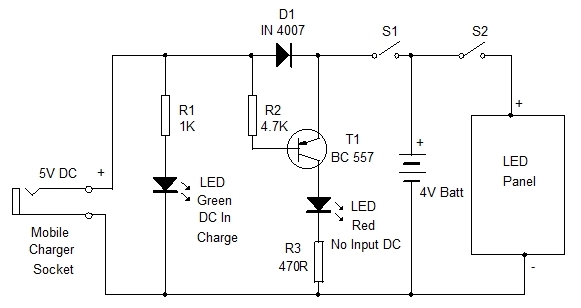 Generally, a 5 V Mobile charger is used in LED Emergency lamps that using 4V Rechargeable Battery. When the charger is connected to the socket, Green LED lights. If the switch S1 is closed, current flows through the forward biased diode D1 and battery charges. At the same time, the base of the PNP Transistor T1 remains high through R2. This keeps T1 off and the Red LED remains off. This indicates that current is flowing into the battery. If S2 is closed, the LED lamp glows by obtaining current from the charger. When the power fails or charger removed, D1 reverse biases and T1 forward biases. This lights the Red LED. Thus it gives two indications. Charging stopped and load on ( if S1 and S2 closed).